Many watches hold a special significance for their owners. Some timekeepers may be a powerful emotional reminder of an esteemed person, place or event. Others the long-searched-for keystone in a valued collection. There are watches that can change your mood and generate a smile just by thinking about them. There are even watches that have changed lives. And above even those hallowed timepieces there is the Holy Grail: the watch I am chronicling here didn’t just change someone’s life, it changed MY life. While I somewhat egotistically feel part of the horological landscape now − the online part of it at least − I’m really a relative newcomer compared to many of my illustrious colleagues. Though I’ve long had an interest in watches of all shapes and sizes, including (and please keep this to yourself) quartz watches, I really only began developing a passion for high-end mechanical wristwatches around the turn of the millennium. As is my nature though, when I take an interest in something I often take it to extremes so it wasn’t too long before my “interest” became much more than that. And, in fact, my interest in horology eventually developed into journalism, a full-time business, a company, a great many friendships and last, but certainly not least, the incredible adventure with Elizabeth, Joshua and GaryG that is Quill & Pad. And it all started with a watch. In 2003, I was an active participant in ThePuristS, now known as PuristSPro. I can’t remember what drew me to the independent forum in particular, but it was likely a mix of the knowledgeable and diplomatic moderator, Curtis Thomson, a generally more thoughtful community, from my perspective at least, than some of the more popular brand forums at the time, and no doubt the fact that the wildest and most interesting wristwatches were being developed at that time by the independent brands and watchmakers. The early 2000s was the dawn of Philippe Dufour (at least to a wider public thanks to the internet), Vianney Halter, Urwerk, F.P. Journe and the Opus series. And for me the A.H.C.I stand was by far and away the most exciting place at Baselworld. I had no emotional attachment to any of the large traditional brands at that time, and as far as I was concerned, watchmaking just didn’t get any better than the independents. I was happy ravenously consuming the content of others and it just never crossed my mind to use the advantage my location provided to give something back. In early 2004 I received an email. It was after I’d commented on ThePuristS Independent discussion forum about Philippe Dufour’s Duality − something along the lines of: “Theoretically, wouldn’t it be more effective to incline the two balances (which were both flat in the Duality) at 45°, i.e. 90° to each other, so they are affected by gravity and shocks in significantly different ways?” (Over a decade later − no doubt having read my comment and taken it seriously − Greubel Forsey presented the Double Balancier along the lines I had in mind). I immediately jumped at the opportunity, and suggested to Max that we spend a few days visiting as many watchmakers as we could. He already had a good list in mind. Lo and behold it came to pass. In a fantastic few days we visited the Les Ambassadeurs boutique in Geneva, F.P. Journe (very new then), the de Grisogono boutique (I believe I referred to one of their watches as more like a weapon of war than a wristwatch), Antiquorum, Audemars Piguet, Philippe Dufour, Urban Jürgensen (dining very congenially with the late Peter Baumberger), and the hero of this story, Mr. Daniel Roth (I use “Mr.” to differentiate the man from his eponymous brand). Roth had parted ways with the brand he created in 2001 and at 55 years of age decided to start all over again: after a lifetime working for brands (Audemars Piguet), launching them virtually from scratch (Breguet), and from scratch (Daniel Roth), he reinvented himself as an independent watchmaker, working alone (except for his wife Nicole and son Jean-Daniel) for the first time in his life. To fully appreciate the beautifully finished, handcrafted timepieces Daniel Roth is currently making, we need to know more about the horological journey he took to get where he is today. Both Daniel Roth’s grandfather and great-grandfather were watchmakers in the region of La Chaux-de-Fonds, Switzerland. His grandfather (understandably) decided to swap the cold Jura Mountains for the sunny Mediterranean and moved to Nice in the south of France, where he opened a watch/clock repair business. As a young boy, Roth first played, then worked in the shop and then enrolled in and completed a three-year watchmaking course in Nice. As an ambitious young watchmaker, Roth moved to the Vallée de Joux, which was then – and still is – considered by many to be the center of the world for complicated watchmaking. He landed a prized position at Audemars Piguet, which numbered just 50 people at the time. Roth sometimes found life difficult because the older watchmakers were so demanding, but they were very knowledgeable in traditional skills and techniques and he absorbed everything he could learn like a sponge. Roth had been at Audemars Piguet for seven years when he learned of an opportunity that excited him: an advertisement that read “Situation Vacant –Watchmaker Wanted” . . . for Breguet! The Chaumet brothers, Jacques and Pierre, were Parisian jewelers who had bought the very run-down Breguet brand and planned to restore it to its former glory. This was 1973, the time of the quartz crisis that decimated Swiss watchmaking, and Breguet was virtually nothing but a name on a shop in Paris. The brand contracted out the few orders for pocket watches they received each year, as they were not equipped to produce them on their own. The Chaumets envisioned Breguet’s future in Switzerland and they needed a talented chief watchmaker to release their dream. The successful candidate would possess the energy and skills needed to revitalize the brand and to start a manufacturing capability from scratch, but would also have to be a visionary – someone who could immerse himself in the long history and culture of Breguet to find and instill all of that in a new generation of wristwatches. I can’t do everything, but . . . However, talented and experienced he was, or thought he was, the confident young Daniel Roth, still in his twenties, did not have the multitude of qualities needed for such a demanding position. What won the Chaumets over was Roth’s honesty and openness. He submitted a simple two-page resumé: the first page highlighting his experience and areas of expertise; the second page listing the skills he thought he would need, but lacked. . . skills, however, he believed he could learn if given the chance. Jacques and Pierre decided that both they and Breguet had found their man and offered young Roth the position. The Chaumets had initially planned to set up a new workshop for Breguet in La Chaux-de-Fonds. However, Roth made it clear that he wasn’t interested in moving from Le Sentier, so they left it to him to find something suitable closer to home. With the Chaumets’ support, Roth first went back to watch school in Le Sentier for a year to get a solid technical and academic base in complications. At the same time, he studied all he could from the Breguet archives and absorbed everything about Abraham-Louis Breguet: lifework, company and watches. While studying in Le Sentier, Roth made a perpetual calendar pocket watch, which was then sold under the Breguet name. It generated sufficient profits to reimburse the Chaumets’ investment and expenses for his year of education. Roth began designing and building watches for Breguet at a small rented atelier in Le Brassus before Breguet was able to buy its own premises. He introduced the perpetual calendar and tourbillon into Breguet’s new wristwatch collection; a move that prompted other brands to produce these complications themselves. Abraham-Louis Breguet (1747-1823) had created timepieces of varying styles, and it was Roth who selected what we now think of as the classic Breguet look from the diverse elements : guilloche dial, blued-steel pomme hands and coin-edge case band. Inspired by a vintage Breguet pocket watch, Roth designed and developed the now-iconic 3130. However, to complete the task he had to work through his holidays. When he told the Chaumet brothers, they magnanimously granted him an extra three days off for his troubles. Roth spent 14 rewarding years with Breguet and stamped his imprint on both the watches and the company. However, the Chaumets went bankrupt (tax problems), so in 1987 Breguet was sold to the investment company, Investcorp. In 1987, Roth left Breguet to embark upon his next big adventure. In 1989, Roth launched “Daniel Roth.” His own brand began with a plethora of ideas, a completely original oval-style case shape and a focus on quality and innovation. For a watchmaker, launching one’s own brand was quite an undertaking. To put the scale of this project in perspective, it had been many decades since a watchmaker launched a serious brand. Not only did Roth do this, he also helped pave the way for Franck Muller, who launched his eponymous brand two years later. The Daniel Roth brand was so respected that it was accepted to exhibit at the prestigious Salon International de la Haute Horlogerie (SIHH) in Geneva. With so much going for the Daniel Roth brand, what could have possibly gone wrong? Well, quite a bit actually. It turned out that Roth was a better watchmaker than businessman. An unfortunate buyout of the brand’s main distributor, Siber Hegner, led to a withdrawal of bank funding. The Hour Glass in Singapore then purchased a majority stake in Daniel Roth, but eventually sold it to Bulgari in 2000, which later completely absorbed the Daniel Roth name into the Bulgari-branded collection. This finally closes the circle and brings us back to 2001, when Roth left the company that bore his name and began working as an independent. And then to 2004 when Max and I visited Roth in the attic workshop located in his Le Sentier home. The attic has been outfitted with all the tools and machines necessary − it turns out you don’t need that many − to create incredible wristwatches from a few raw metal bars and a lot of skill and hard work. Max, by now my friend, was so impressed with Roth’s work that he ordered one of the first “Jean Daniel Nicolas” Two-Minute Tourbillons (christened according to an amalgamation of the names of Roth’s wife Nicole, son Jean-Daniel, and himself). However, this watch would not be THE first timepiece in the series: Roth was already in the process of constructing No. 1, the numeral Max coveted so badly. In a flash of inspiration, Max asked if he could have number “0”. . . and Roth agreed. As Max spoke no French and Roth no English, I became their translator and visited the Roths many times over the following two years it took for the watch’s completion. Roth has now managed to reduce the time it takes him to make one watch to around four months, so can make a maximum of three per year . . . if he doesn’t take any time off or a holiday. I went up to Le Sentier every month or so to follow and record the progress of the creation of this magical tourbillon as it was slowly being brought to life. I saw a master of the art applying guilloche in Geneva waves to the silver dial; Roth transforming bars of metal into gears, wheels and pinions; and the hands being blued and the movement being assembled and cased. Following the creation of that two-minute tourbillon was akin to a two-year horological master class for me, and the Roth family became − and I’m happy to say still are − good friends. What makes this tourbillon so special? It is hand-crafted like few watches are today, using traditional watchmaking techniques that Abraham-Louis Breguet himself would easily recognize. The high arches of the “bat-wing” tourbillon bridge are an example of form following function: they are necessary so you can see the 0 and 60-second section of the second scale. That “bat-wing” tourbillon bridge is one of the largest flat-polished (also know as black polish) pieces of steel you are ever likely to see, and the difficulty in achieving that level of finish grows exponentially with surface area. The seconds displayed by tiny arrow-shaped hands on the tourbillon cage look to be retrograde because of the two-minute rotation. One of the hands is blued steel, the other gold; Roth has used the different masses of the metals to balance the cage without having to add more weight, which is detrimental to precision. The full mainplate visible through the display back is unusual for the Vallée de Joux where finger bridges are more common. However Roth closed this because he wanted a relatively sober back to contrast with the more detail-rich dial side. The “waves” on that full movement plate on the back are not J-shaped Geneva waves, but U-shaped waves. Roth saw the finish on an old pocket watch and spent weeks teaching himself how to make them. I’ve not seen them on any other watch. The Two-Minute Tourbillon doesn’t just look good; Roth regulates his watches to observatory-class precision. The three-piece cases are not screwed together − that would be too easy and the screw-heads would mar the purity of the case shape. They are clipped together as fine watch cases traditionally were, a method requiring much higher levels of precision in manufacture. As I got to know Daniel Roth better over that time, I thought what a fascinating life he had and was disappointed not to be able to find more information about him on the internet. This led to me thinking that I probably knew as much about Roth as anyone, so I decided to write an article about him for ThePuristS (some of which I have purloined for the history section of this tome). ThePuristS independent forum moderator, Curtis D. Thomson, and site founder, Thomas Mao, were already writing occasionally for iW magazine in America and thanks to recommendations by them I received a call from then iW editor, Gary Girdvainis (now editor of WristWatch Magazine), who asked if he could publish my Daniel Roth article in iW. My first shaky baby steps as a watch journalist had begun. That Roth article led to another piece about an up-and-coming brand making some waves at the time, and continues to do so: Greubel Forsey. Before I knew it, I was iW’s Swiss correspondent (Elizabeth Doerr was long a regular contributor to iW at that time as well). One thing led to another and I began writing for a number of magazines and even wrote a book with Peter Speake-Marin for the 25th anniversary of the A.H.C.I. called Hands of Time. It isn’t easy making a living as a full-time watch journalist as I’m sure any of my colleagues will attest, especially when you spend far too much time watching and talking to watchmakers and less time writing about them. So, I began writing press releases and website texts for independent watchmakers and small brands and that led to a small communications business called “underthedial,” which is now my main day job. And that special Jean Daniel Nicolas watch? When I met Max back in 2004 I wasn’t by any means a serious collector or even a casual collector − I still would not consider myself a serious collector now − because the watches I was most passionate about were far beyond my financial means. After two years, the No. 0 Jean Daniel Nicholas Two-Minute Tourbillon was finally ready, but Max’s life was going through a few changes. After he picked his watch up, he asked if I would keep the watch in Switzerland until he had more stability. So I put the watch that I had spent two years following and chronicling, the watch that was responsible for my budding career as a watch journalist, in my bank safe deposit box . . . and basically forgot about it. Seriously. 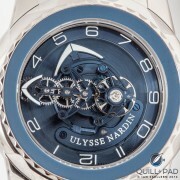 And there the JDN Two-Minute Tourbillon remained for two years until I received a call from Max. His life had returned to a more even keel, but, unfortunately, the watch that had meant so much to both of us would have to be sold. I casually asked how much he was asking. Not for me, but in case I came across any potential buyers. Max replied with a fair figure based on how much the watch had cost him at the time. I mentally translated Max’s figure from pounds to Swiss francs. The gods of international exchange rates must have been in a good mood because when Max paid for the watch years before, the pound was strong against the Swiss franc, and now it was weak. This meant that although it was still an eye-wateringly large sum for somebody who had never spent even $5,000 on a watch, the Jean Daniel Nicolas Two-Minute Tourbillon No. 0 that had changed my life in so many ways − including leading to the opportunity to launch Quill & Pad with Elizabeth − was (just barely) within my reach and with the help (and required blessing) of my wife became mine. 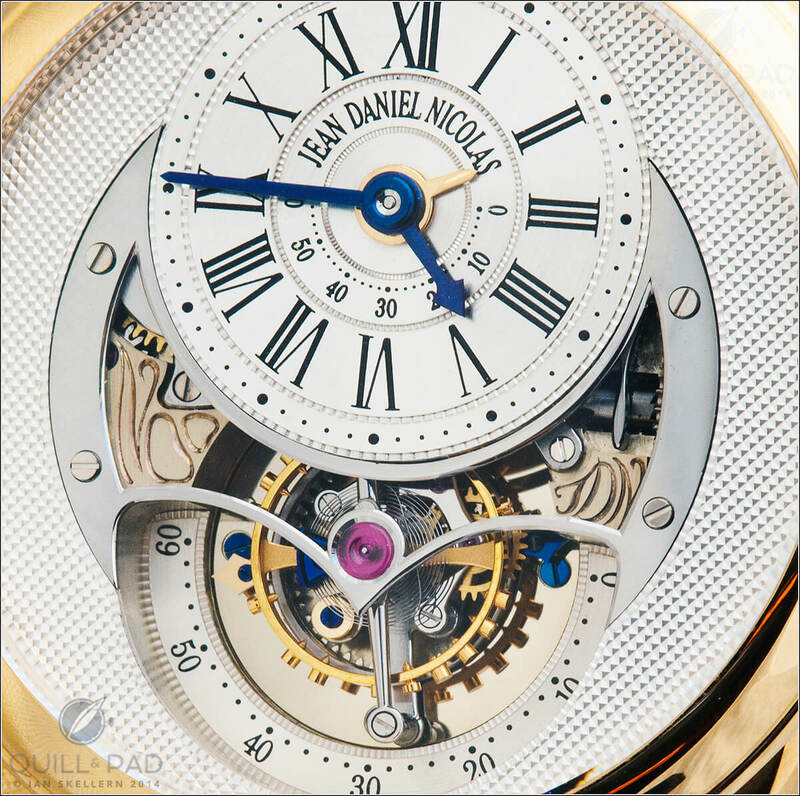 And there is one that has done all of the above and more for me: the Jean Daniel Nicolas Two-Minute Tourbillon No. 0. Jean Daniel Nicolas does not (yet) have a website, but if you would like to send Daniel Roth a message, let me know and I’ll be happy to put you in touch. * This article was first published on August 7, 2014 at The Watch That Changed My Life: The Jean Daniel Nicolas Two-Minute Tourbillon By Daniel Roth. You may find some of the comments there interesting. he had any input to it? Mr. Roth did sell his company and brand, so he knew he was losing the right to his name as well. This is a wonderful article. My father was a collector and was lucky enough to have met Mr Roth through one of his agents in the late 90s. My father already had the no 1 of a limited set of tourbillons that Mr Roth had produced for Asprey and took the watch to show Him. He was also fortunate enough to have been in a position to commission a special one of one piece by Mr Roth (simple time only watch with an enamelled falcon on the dial). It was I believe one of the last watches Mr Roth made shortly before his company was bought by Bulgari. When my father passed away a few years ago these two watches were the only ones I wanted to keep for myself given the person connection and how honoured my father felt to have met someone like Mr Roth and to have owned his timepieces. Thank you for sharing your story here, Sarah. I will be seeing Mr. Roth tomorrow and I will let him know.